Freezing is a quick and easy way to preserve your fruit and provides an alternative to bottling and drying it. This method helps retain more of the fruit’s nutrients than other methods and is much quicker, so is handy if you’re short on time. Freezing fruit is a great way of dealing with large gluts, if you grow your own, or ensuring you have plenty of fruit to eat during the winter months. It can easily be de-frosted and added to dishes or desserts. When selecting your fruit for freezing it’s a good idea to choose only firm, just-ripe fruit and rinse and blanch them before freezing. Freeze them as soon as you can after harvesting, and avoid fruits, which are bruised or damaged. Pack them into a plastic air-tight freezer bag or container and secure it firmly. This will ensure they keep well in the freezer and will be edible when you de-freeze them. Some fruits, such as apples, tend to go brown very quickly after being sliced into pieces. You can delay the time it takes for them to go brown (and give yourself more time to prepare them and get them into the freezer) by soaking the fruit pieces in lemon juice, or weak vinegar solutions. As with bottling and drying your fruit, it is unlikely it will be of the same consistency or texture once it has been frozen. Many fruits contain a lot of water, and this can crystallise in the fruits and rupture their cell walls. The fruit will therefore be much softer when it is de-frosted than before it went into the freezer. You can prevent this from happening to some extent by cooking, or blanching the fruit first. Cooking or blanching fruit also affects the cell walls, so the effects of freezing the fruit are lessened. Freezing at very low temperatures will also reduce the damage caused to cell walls as the water within the cells forms tiny crystals. The longer it takes to freeze the fruit, the bigger the crystals formed and the more damage caused to the cell walls. Freezer burn is another common problem associated with freezing fruit, but it’s relatively easy to prevent. It happens when moisture is lost from the fruit whilst it is inside the freezer. This results in a brown spot developing where the moisture has been lost and the texture of the fruit becomes dry and tough. Simply pack your fruit into heavy-duty freezer bags or plastic containers and freezer burn should be avoided. 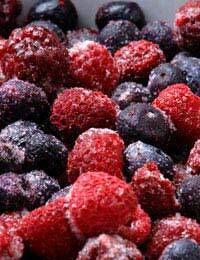 Most frozen fruits remain at a high quality for eight to 12 months. To keep them for longer, consider blanching them in a solution of sugar syrup before freezing. Simply wash them in running water and drain thoroughly. Freezing fruits in dry sugar or a sugar syrup solution will help to retain their colour and texture. You can make sugar syrup by simply dissolving 675g of sugar into 1.5l of warm water. Place the fruit into your chosen freezer container; add the syrup, and freeze. It’ best to de-frost your fruits at room temperature in its original packaging. This helps to preserve its quality and the level of nutrients within them. If you need to de-frost your fruit quickly, submerge the container in lukewarm water, or place in a warm area. You should eat your fruit as soon as it has defrosted, preferably when it is still cold. Freezing fruit is a fantastic way to deal with gluts and should hopefully see you through the winter months with a blackberry pie, or two, or a raspberry tart. How long should I blanch apples? Thanks Jade.I thought it would be alright to freeze fruit raw so will try it.Might go half and half, some raw and some blanched and see if there is a difference. My mum freezes all sorts of berries as she picks them - raspberries, blackberries, different types of currants etc - and uses them for puddings, jam, fruit jellies as and when she needs them. I've never seen her cook them first, but she freezes the berries on a large tray so that they don't stick to each other. The frozen berries are them tipped into plastic tubs or bags for storage in the freezer. Having frozen them individually, it makes it easy to take out the exact quantity of berries when you're ready to use them instead of having to use a block / bash them apart like frozen peas!